NBA teams desiring to win a championship seek to place three game-changers on their roster. LSU had its own version of a ‘Big Three’ show up against Mississippi State last Wednesday night. Point guard Tremont Waters and post players Naz Reid and Kavell Bigby-Williams combined for 69 points in the Tigers’ 92-88 overtime victory over the Bulldogs in Starkville. Waters scored 26 points and handed out five assists. He made 11 of his 18 shots from the field. Reid matched his season-high with 29 points – six coming in the final minute of the overtime period. Bigby-Williams recorded another double-double with 14 points and 13 rebounds. 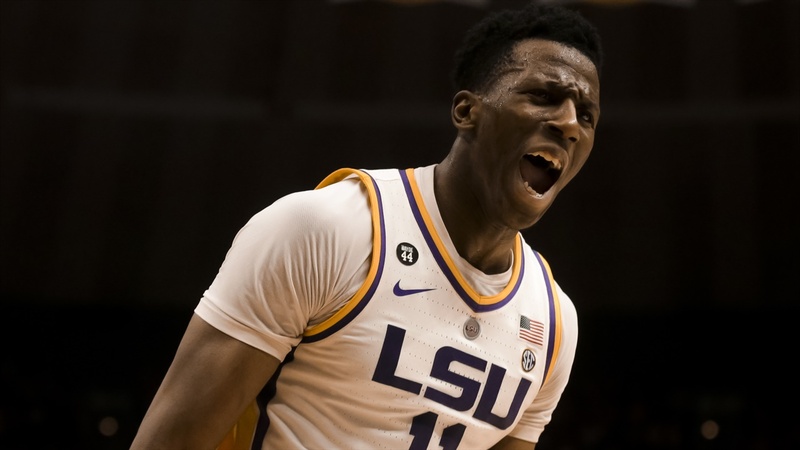 Waters, Reid and Bigby-Williams have been LSU’s top three performers in the first half of the Southeastern Conference schedule. These three players have helped the Tigers win eight of their first nine league games going into Saturday’s game against Auburn at the PMAC (1 p.m. Central/ESPN2). In conference games, Waters is averaging 20 points and six assists. He is shooting 50 percent from the field, including 38 percent on 3-pointers. Reid is contributing 16 points and six rebounds a game. He is shooting 49 percent from the field, including 53 percent on 3-pointers. Waters and Reid were highly-rated players when they signed with LSU. Reid was considered to be a possible NBA lottery pick last summer after one season. Reid’s output lately is letting everyone understand why he was ranked in such a way. Waters and Reid have become quite adept at a two-man game – using pick-and-rolls and pick-and-pops. Mississippi State had no answer for those plays. Reid exhibited his two different offensive skills in the final minute against Mississippi State. His old-fashioned three-point play gave the Tigers the lead for good. Then, Reid’s 3-point basket put LSU ahead by four points with 15 seconds to play. Reid scored 24 of his 29 points after halftime. Bigby-Williams was not expected to be a major contributor for the Tigers. Wade was simply hoping that Bigby-Williams, who sat out last season after transferring from Oregon, would provide some post defense. Bigby-Williams is blocking two shots per game against SEC opponents. In addition, Bigby-Williams is doing other things for LSU. A former junior college All-American, Bigby-Williams is contributing nine points and eight rebounds per game in SEC play. Bigby-Williams is making 73 percent of his field goal attempts against SEC teams. He was 6-of-6 from the field at Mississippi State. “My basketball IQ is better now than what it was at Oregon,” Bigby-Williams said. “I know where the other players are going to be. My scoring is just a bonus. The Tigers cannot celebrate the victory against the Bulldogs with Auburn coming to the PMAC. Auburn is led by point guard Jared Harper, who is averaging 15 points and six assists per game. Wing Bryce Brown, who is Auburn’s top scorer at 17 points per game, is making 41 percent of his 3-point shots. “Our last home game against Arkansas did not end well,” Waters said. “We realized that every play matters and every game matters. We did not have a great feeling after that game and it starts with me. I have to have a better approach.